I bound off the shoulderette on the train this morning. Tonight I'll wash it (train hands are dirty) and pin it to something, and keep working on the lovely gloves I cast on last night. Yes, these are probably the most adorable gloves you've ever seen. I found them on Saartje's blog, and she linked to Nanette's blog, where I found the smallest pattern photo ever. The gloves come from a Japanese book, but since I'm cheap and clever I'm deciphering the pattern and trying to knit something glove-like from how I'm guessing it should be done. I really like Nanette's cuff, so I'm kind of following her example. My colors are baby pink, raspberry and brown. I think I'm on gauge, around 30, but I also think my hands are kind of small, so maybe I'll go down a needle size, from 2.5 to 2mm (oh my gosh that's tiny!). I'm using Drop's Alpaca, since it's the bestest yarn ever. I've never done gloves before, and the mittens I've done didn't have a thumb "wedge" like these. It's not really glove season, but I'd like something for my hands that isn't too warm and clumsy. This might be it. Pictures of the shoulderette on my bare shoulders will be published on Monday, during the awful ball hangover. Oh, I'm really looking forward to seeing the shoulderette, I think it'll look great on you! 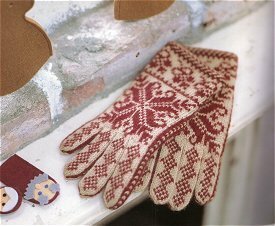 And good luck with the gloves - I used to have a pair of gloves in baby blue and white that I loved, but I lost them last year... :'( So I'm thinking you should knit them, and then you can tell me how to do it!!! Good luck on the ball!